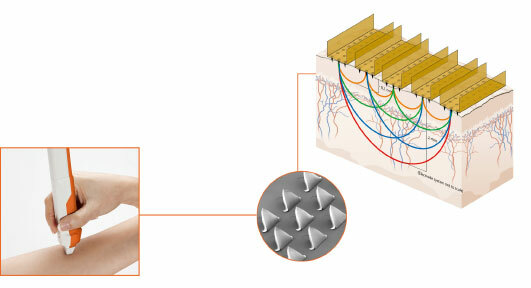 The core of our technology is an extremely sensitive electrode. It has five bars, with a total of 200 microscopic pins, where electrical signals pass between the bars to measure the impedance (resistance) in the lesion. The idea of developing an electrode to assess skin cancer was first conceived when researchers realized that it was possible to identify the different electrical properties of healthy skin compared to irritated skin. As the long development process continued, it became clear that it was also possible to detect the different impedance characteristics typical of cancerous vs. non-cancerous cells. says Anna Danström, Director of Production, at the production site in Uppsala, Sweden. The materials used at the heart of the electrode include a mix of plastic, special purpose adhesives, contact pins, electrical components and gold. Highest quality biomedical grade gold coating covers the patient contacting micro structures of the electrode. Gold is used because of its outstanding electrical conducting properties and biocompatibility. It is also relatively inert and so will not oxidize easily, resulting in an electrode contact surface that will remain stable over time. Overall there are 17 manufacturing steps. The first steps include the production of a single use mold – necessary to obtain the correct micro-structures needed for the electrode pins on the contact face of the electrode. The next steps involve mounting the pin micro-structures to the electrical components included in the electrode. In the final stages, the electrode is mounted into its plastic casing, undergoes rigorous final testing and then is packed into it’s protective container for final packaging. Because of the many production steps, it takes several weeks to produce a single electrode. Since a cancer foci can be very small, the micro structures of the electrode need to be extremely precise and many steps in production are performed using a microscope. Producing high-precision diagnostic disposables is a process that places high demands on materials and technology but also of the employees. A fully skilled operator takes months to train and perfect vision is required. Malignant melanoma is a severe form of cancer and the electrodes need to be in perfect condition to generate reliable results. Therefore, there are several quality controls, during production as well as on the final electrode, prior to being packed in boxes and delivered to clinics around the world. When the electrodes reach the clinics they are attached to the probe of a Nevisense device and used to perform impedance measurements on a patient’s skin. Those measurements are analysed in seconds using a software classifier and a risk score for melanoma is provided to the clinician. The validity of this score is proven in the largest clinical study* of its kind. This is then used in the diagnostic process together with visual examination results to evaluate whether the lesion should be excised or not.